Lynde Lord was born in 1733. He was the son of Richard Lord. Lynde Lord died in 1801. Lynde Lord married Mary Lyman, daughter of Joseph Lyman. Lynde Lord was born in 1762. He was the son of Lynde Lord. Lynde Lord died in 1813. Married Name Her married name was Pierpont. Mary Sheldon Lord was the daughter of Lynde Lord and Mary Lyman. Mary Sheldon Lord married John Pierpont Pierpont. John Pierpont Pierpont married Mary Sheldon Lord, daughter of Lynde Lord and Mary Lyman. Juliet Pierpont married Junius S. Morgan. Juliet Pierpont was born in 1816. She was the daughter of John Pierpont Pierpont and Mary Sheldon Lord. Juliet Pierpont died in 1884. Junius S. Morgan married Juliet Pierpont, daughter of John Pierpont Pierpont and Mary Sheldon Lord. Name Variation John Pierpont Morgan was also known as J. P.
John Pierpont Morgan was born in 1837. He was the son of Junius S. Morgan and Juliet Pierpont. 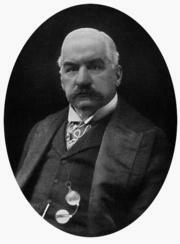 John Pierpont Morgan died in 1913. American Banker. John Piermont Morgan I was one of the wealthiest men at the beginning of the 20th century. A financier and banker, he arranged the merger for General Electric, and his bank today is known as Morgan Stanley. Married Name Her married name was Touchet. Anne Echingham married John Touchet, son of James Touchet and Margaret De Ros. Anne Echingham was born circa 1431. Anne Echingham died on 7 May 1498. Anne Echingham had 7 children. Married Name Her married name was Echingham. Margaret Knyvett married Sir Thomas Echingham, son of Sir William de Echingham and Joan Fitzalan. Margaret Knyvett was born circa 1400. She was the daughter of John Knyvett and Margaret Baynard. Margaret Knyvett died in 1467. Sir Thomas Echingham married Margaret Knyvett, daughter of John Knyvett and Margaret Baynard. Sir Thomas Echingham was born circa 1400. He was the son of Sir William de Echingham and Joan Fitzalan. Sir Thomas Echingham died on 15 October 1444. Thomas Echingham was born in 1423. Thomas Echingham married Margaret West in 1448. Thomas Echingham died in 1482. Married Name Her married name was Blount. Married Name Her married name was Oxbridge. Margaret Echingham married (?) Oxbridge. Margaret Echingham married William Blount. Margaret Echingham was born in 1449. She was the daughter of Thomas Echingham and Margaret West. (?) Oxbridge married Margaret Echingham, daughter of Thomas Echingham and Margaret West. Alice Blout Oxbridge married (?) Owen. Alice Blout Oxbridge was born in 1504. She was the daughter of (?) Oxbridge and Margaret Echingham. Alice Blout Oxbridge died in 1526. (?) Owen married Alice Blout Oxbridge, daughter of (?) Oxbridge and Margaret Echingham. David Lloyd Owen was born in 1526. He was the son of (?) Owen and Alice Blout Oxbridge. David Lloyd Owen died in 1565. Edward Owen married Margaret Madryn. Edward Owen was born in 1565. He was the son of David Lloyd Owen. Edward Owen died in 1595. He was born in 1595. He was the son of Edward Owen and Margaret Madryn. William Owen was born in 1630. He was the son of Richard Owen. John Owen was born in 1685. He was the son of William Owen. Married Name Her married name was Todd. Hannah Owen married (?) Todd. Hannah Owen was born in 1725. She was the daughter of John Owen. Hannah Owen died in 1814. (?) Todd married Hannah Owen, daughter of John Owen. Levi Todd was born in 1756. He was the son of (?) Todd and Hannah Owen. Levi Todd died in 1807. Robert Smith Todd married Elizabeth Parker. Robert Smith Todd was born in 1791. He was the son of Levi Todd. Robert Smith Todd died in 1849. Married Name 4 November 1842 As of 4 November 1842,her married name was Lincoln. Mary Todd was born in 1818. She was the daughter of Robert Smith Todd and Elizabeth Parker. Mary Todd married Abraham Lincoln, son of Thomas Lincoln and Nancy Hanks, on 4 November 1842 at Illinois. Mary Todd died in 1882. First Lady. 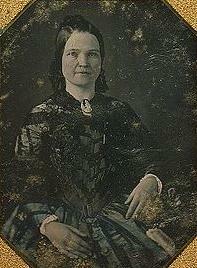 The wife of Abraham Lincoln, Mary Todd Lincoln visited many wounded Union soldiers during the Civil war. After the murder of her husband, she grew depressed and was heavily criticized by Lincoln's former cabinet. Abraham Lincoln was born on 12 February 1809 at Kentucky. He was the son of Thomas Lincoln and Nancy Hanks. Abraham Lincoln married Mary Todd, daughter of Robert Smith Todd and Elizabeth Parker, on 4 November 1842 at Illinois. Abraham Lincoln died on 15 April 1865 at District Of Columbia at age 56. Elizabeth Parker married Robert Smith Todd, son of Levi Todd. Married Name Her married name was Whitney. Constance Touchet married (?) Whitney. Constance Touchet was born in 1443. She was the daughter of James Touchet and Margaret De Ros. Constance Touchet died in 1531. (?) Whitney married Constance Touchet, daughter of James Touchet and Margaret De Ros. Married Name Her married name was Puleston. Eleanor Whitney married (?) Puleston. Eleanor Whitney was born in 1467. She was the daughter of (?) Whitney and Constance Touchet. Eleanor Whitney died in 1482.